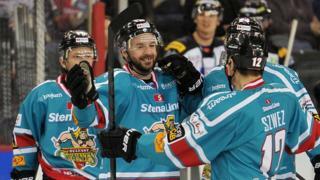 Belfast Giants move seven points clear in the Elite League standings with an important 5-2 win over Sheffield Steelers on Saturday night at the Odyssey Arena. Sheffield took the lead through Stephen Goertzen but goals from Colin Shields and Robby Sandrock gave the home side a 2-1 first-period lead. Colin Shields grabbed his second of the game to make it 3-1, before Drew Fata fired in off Jeff Mason with 1.40 left to make it 3-2. Buit with Sheffield's netminder withdrawn, Sandrock and Kevin Saurette fired in late strikes to give Belfast a three-goal winning margin.